The Dura-Ace hubset uses a single piece, aluminum alloy hub shell. The "Dura-Ace" name is engraved into the center of the hub and trimmed with Black paint inside the lettering. The hubs use loose ball bearing construction. The front hub has ground steel bearing cups pressed into each side of the hub shell. Eleven 4.75mm (.1870") diameter steel ball bearings are used in each. The balls are made of ferritic stainless steel, which are generally just slightly stronger than carbon steel. The bearings, on each side, are closed off from the outside by a snap-in plastic dust cap. The dust cap has two interlocking pieces which revolve against each other. When the upper (outer) piece is revolved to the "open" position, two small holes open up, permitting grease to be injected into the bearing cavity. The steel cone races have ground and polished bearing surfaces, with a groove cut around the perimeter. A custom molded rubber seal sits in this groove to close any remaining gap between the cone race and dust cap. The locknuts are made of steel. The 7430-HG Dura-Ace rear freehub is Hyper and Uni Glide compatible. It uses a 130mm long axle to permit an 8 speed gear range. The non-drive side has a steel bearing cup pressed into the shell, while a steel cup raced freehub is used on the drive side. Both sides use nine 6.35mm (1/4") diameter steel ball bearings. Like the front bearing assemblies, the non-drive side uses the same plastic dust cap capable of external grease injection. It also uses the same cone race and rubber seal. The locknut is also made of steel. The drive side bearings lack the plastic dust cap, but use the same cone race and similar locknut. Both axles are made of steel, the front is 9mm and the rear is 10mm in outer diameter. The Dura-Ace hubset comes with a well chrome plated pair of quick release skewers that rely on an internal cam design that constricts to close and lock the hubs on the bike. The adjusting nut of beautifully machined steel, with an internal brass thread lock. 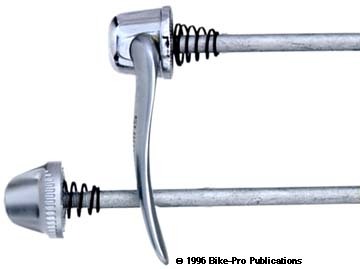 For a finger grip the adjusting nut has traditional chromed D- rings. The front hub has a 46mm hub flange diameter, with flanges spaced 70mm apart. The front spoke holes have a 38mm center circle diameter. The rear hub has a 52mm hub flange diameter, with flanges spaced 54mm apart. The rear spoke holes have a 44mm center circle diameter. With skewer, the front weighs 235.5 grams, (skewer is 91 grams), the rear with skewer, and without cogs, weighs 463 grams, (skewer 95 grams). The front hub requires a two thin cone wrenches to work on, because Shimano leaves just a 2.5mm access to the cone race and the locknut. You will need two 13mm cone wrenches to hold the cone race, while an adjustable wrench will loosen the locknut. For the same reasons you will need two thin 14mm to hold the cone race, on the rear, and an adjustable wrench will remove the locknut. 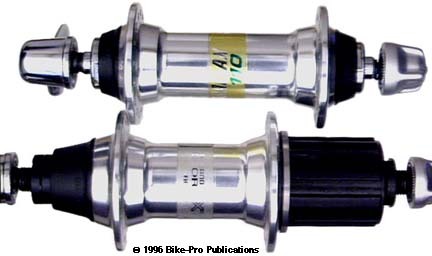 The Dura-Ace hubs have a high polished Silver finish, and we bet that Shimano has these scheduled for a work over, and a weight reduction program, in the 1996 model year (we already know it won't happen in the 1995 model year). The hubs are available in either 28, 32 or 36 hole drilling, matched the way you want. Please specify hole pattern. The most noticeable difference between the 105SC and the Ultegra hubset is the Ultegra shells aren't painted. Instead they are left a clear anodized Silver aluminum. The hubs again begin as using a one-piece, hub shell, made of forged aluminum. Steel cup races are pressed and bonded into the aluminum shell. The front axle has a 9mm outer diameter, with steel cone races using custom rubber seals to close the space between the cone and the dust cap. Ten 4.75mm (.1875") diameter steel ball bearings are used in each side of the front hub. The ball bearings are closed off from the outside by a dark Grey colored snap-in plastic dust cap. 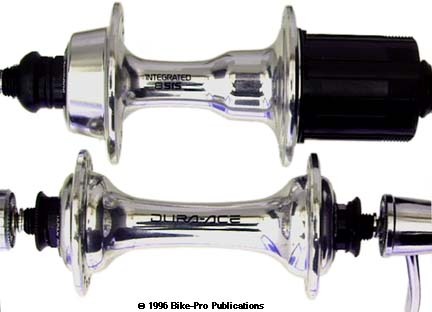 Unlike the 105SC version, the Ultegra dust cap has no steel band to re-inforce it. The rear hub is a cassette style freehub that uses nine 6.35mm (1/4") steel ball bearings on each side. The hollow rear axle has a 10mm outer diameter and both axles have a 5.5mm inner diameter. The steel cone races on the rear hub also have a groove that holds a custom rubber seal that closes the gap between the cone race and the Grey plastic snap-in dust cap. The freehub is the 6402-HG model which accommodates 8 speed HyperDrive shifting using a 130mm long axle. The pair come with a quick release skewer set, made of steel that use an internal cam to constrict and lock the hubs on. The adjusting nut is made of steel, and jacketed in Silver plastic. The front hub has a 46mm hub flange diameter, with flanges spaced 70mm apart. The front spoke holes have a 38mm center circle diameter. The rear hub has a 54mm hub flange diameter, with flanges spaced 70mm apart. The rear spoke holes have a 45mm center circle diameter. With skewer the front weighs 211.5 grams, (skewer is 75.5 grams), the rear with skewer and without cogs, weighs 428.5 grams, (skewer 80.5 grams). 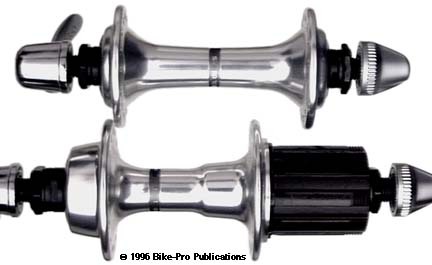 The front hub uses a 13mm cone wrench for both cones, the rear uses a 15mm. The hubs are available in either 28, 32 or 36 hole drilling, matched the way you want. Please specify hole pattern. Shimano's 105SC hubset uses a one-piece, molded or forged, hub shell construction, into which steel bearing cup races are pressed. 105SC hubs use ten 4.75mm (.1875") loose steel ball bearings. There are tight fitting Grey plastic, steel re-inforced, snap-in seals, that surround the axle to keep contaminants out. The hubs have a hollow steel axle with steel cone races. The cone races have a groove around the circumference for a custom molded Black rubber seal to assist the snap-in dust caps. The front axle has a 9mm outer diameter, the rear has a 10mm O.D., both have a 5.5mm inner diameter. The rear hub is a cassette style freehub, using nine 6.35mm (1/4") steel ball bearings on each side. The rear steel cone races have the same rubber seals, and the non-drive side has the same snap-in dust cap. The freehub is the 1056-HG, Shimano Hyperglide compatible 8 speed system using a 130mm axle and enjoys the advantage of the bearing being spaced at the axle extremes. 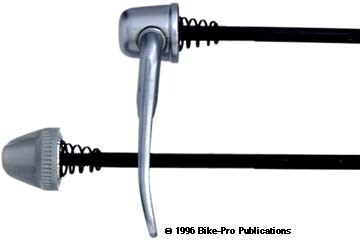 The hubsets come with Shimano 105SC skewers, made of cast and machined steel with a Silver colored, plastic jacketed, adjusting nut, and a 5mm diameter steel skewer rod. 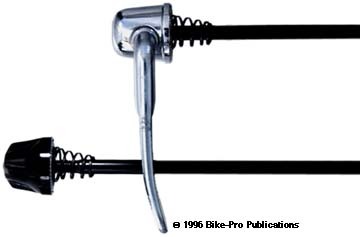 The quick release skewer uses a an internal cam to contsrict and lock the skewer closed. The 105SC front hub, with a 46mm hub flange diameter, has 70mm spaced flanges and weighs, with skewer 214.5 grams, (skewer 78 grams). The rear freehub, which has a 54mm flange diameter, with 55mm spaced flanges. With skewer, and without cogs, it weighs 426.5 grams, (skewer 83 grams). The front hub uses a 13mm cone wrench for both cones, the rear uses a 15mm. The hubs come painted in the Shimano 105SC Grey color only. The hubs are available in either a 32 or 36 hole drilling, matched the way you want. Please specify hole pattern. For the 1995 model year, Shimano will introduce a new version of the XTR hubset that will conform to their new "Parallax" style. At this time specifics including weight, and price are unknown. They are expected to be available for sale as aftermarket replacements by January/February 1995. The XTR hubset uses a one-piece, forged or molded aluminum hub shell for both the front and rear. The aluminum hub shells have steel cup races pressed into them. The front hub uses eleven 4.75mm (.1870") steel ball bearings on each side. The hollow front axle has a 9mm outer diameter and a 5.25mm inner diameter. The highly ground and polished steel cone races have a groove around the perimeter in which a custom rubber seal is seated. 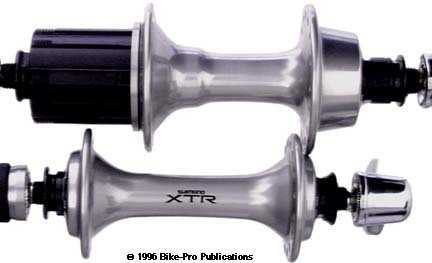 The XTR front hub uses Black plastic dust caps to close off the bearing cavity. The Black dust caps thread into each side of the hub, they are not merely snap fit in. The rear cassette freehub is the Shimano M900 XTR 8 speed. It's HyperDrive compatible and uses nine 6.35mm (1/4") steel ball bearings on each side. The balls are made of ferritic stainless steel, which are generally just slightly stronger than carbon steel. An aluminum ring is pressed onto the freehub body and located at the base of the splined area. The aluminum ring prevents contact, wear and damage to the aluminum spider arm assembly of the M- 900 cassette. 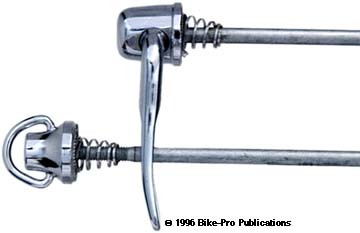 Both the M-900 and the M-737 have the aluminum arm set, which can be mistakenly over tightened against the freehub body's native steel surface. The bearing cavity on the non-drive side is closed off by a Black plastic dust cap which threads into the hub shell. 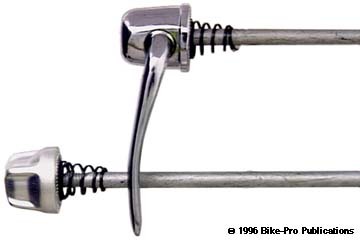 The pair come with a quick release skewer set, made of steel that use an internal cam to constrict and lock the hubs onto the bike. The adjusting nut is made of cadmium plated steel that is enclosed or "jacketed" by an aluminum cap. The aluminum enclosure is anodized in a Ti Grey color to match the hubset and has a deeply recessed ridge seating a thick rubber O- ring for finger grip. The front hub has a 46mm hub flange diameter, with 70mm spaced flanges. The front spoke holes have a 38mm perimeter circle diameter. The rear hub has a 54mm hub flange diameter, with flanges spaced 56mm apart. The rear spoke holes have a 45mm center circle diameter. The front axle has a 9mm and the rear has a 10mm outer diameter, with a 5.25mm inner diameter. With skewer, the front weighs 217 grams, (skewer is 80.5 grams), the rear with skewer and without cogs, weighs 458 grams, (skewer 86.5 grams). The front hub, because Shimano uses a thin locknut and thinly exposed cone race, will require two thin 13mm cone wrenches to loosen or tighten the cones. The rear for the same reasons will require two thin 14mm cones wrenches for even basic adjustments. The XTR hubset is anodized in a faint Grey color. The hubs are available in either 28, 32 or 36 hole drilling, matched the way you want. Please specify hole pattern. 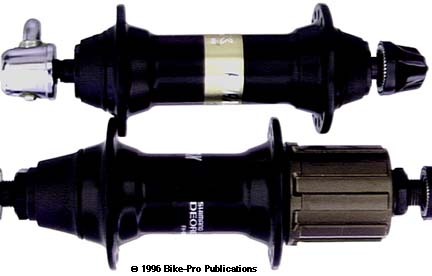 In the 1994 model year Shimano introduced their Parallax style hubset for the Deore XT group. Though these hubs use series interlocking channels and rubber enclosure to seal well the bearings, it does not use sealed bearing cartridges. Both hub shells are made of aluminum alloy. Steel bearing cups are pressed into the hub shell. The front hub uses ten 4.75mm (.1870") diameter steel ball bearings on each side. The cup and bearings is covered by a cadmium plated steel snap-in dust seal which leaves a raised edge that is enclosed by the cone race assembly sealing dirt out. The axle is machined from aluminum alloy, with the centermost 40mm having an 11mm diameter. The remaining 27mm on each end of the front axle are the standard 9mm diameter to fit all standard fork ends. Threading over this 27mm length is a steel sleeve that has the cove race ground from its flared end. Each of the thread on sleeve/races weighs 13 grams, and surrounds the steel dust cap and the bearings while making no direct contact to introduce friction. 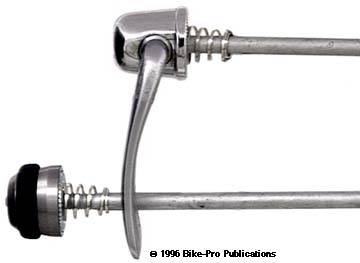 An outer steel locknut maintains the needed 9mm diameter to the bike. A custom molded rubber seal encloses the entire bearing race. Its base seats into a trough around the snap-in steel dust cap, while its top grips the locknut. With each revolution, on the XT hubs, these rubber seals add slight, but measurable drag and resistance. The hub, with these seals in place, doesn't freely revolve. Removal will decrease drag, is easy, and you will gain 3 grams per pair. The rear freehub is the M737 XT freehub. It Hyper compatible, uses a 135mm long axle to accommodate 8 speed shifting. An aluminum ring is pressed onto the freehub body and located at the base of the splined area. The aluminum ring prevents contact, wear and damage to the aluminum spider arm assembly of the M-900 cassette. Both the M-900 and the M-737 have the aluminum arm set, which can be mistakenly over tightened against the freehub body's native steel surface. The rear non-drive side uses the principles as the front in construction, while the drive side uses a bearing cup built into the outer end of the freehub. Both bearing assemblies use nine 6.35mm (1/4") diameter steel ball bearings. The non-drive bearings are initially protected by a steel snap-in dust cap, which leaves a raised ridge that the steel cone race closes over. The axle has a 10mm outer diameter with a fairly traditional cone race that's ground and polished. A steel skirt on the race surrounds the steel dust cap but doesn't make physical contact to increase friction. A custom rubber seal encloses the non-drive side of the rear hub leaving just a spacer and the locknut exposed. The XT hubs come with a pair of quick release skewers made of steel that use an internal cam to constrict and lock the hubs onto the bike. The adjusting nut is made of cadmium plated steel that is enclosed or "jacketed" in an aluminum cap. The aluminum enclosure is a matte Silver in color in contrast to the polished Silver finish of the hub shells. The aluminum cap has four position points for the fingers to grip. The front hub has a 46mm hub flange diameter, with flanges spaced 68mm apart. The front spoke holes have a 38mm center circle diameter. The rear hub has a 54mm hub flange diameter, with flanges spaced 55mm apart. The rear spoke holes have a 45mm center circle diameter. With skewer, the front weighs 231.5 grams, (skewer is 79.5 grams), the rear with skewer and without cogs, weighs 477 grams, (skewer 85.5 grams). The front hub requires a two thin cone wrenches to work on, because Shimano leaves just a 2.5mm access to the cone race and the locknut. You will need a 13mm for the cone race, and a 17mm for the locknut. For the same reasons you will need a 17mm for the locknut on the rear and a 15mm for the rear cone race. The hubs are available in either 28, 32 or 36 hole drilling, matched the way you want. Please specify hole pattern. 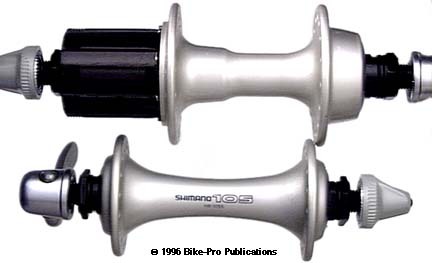 In the 1995 model year, Shimano will introduce an 8 speed Deore LX hubset. The LX hubs already use the 135mm long axle, but have a freehub body that has just 30.5mm of cog carry length, while the XT and XTR hubsets have a 34.5mm cog carry length. It seems that merely changing the freehub body on the LX hubs to, say the one used on the XT set will achieve this aim. The LX hubs are incredibly like the XT hubs, almost as though the LX models were the proving ground for the few refinements of the XT hubs. The hubs have aluminum alloy hub shells. The XT model has the shells polished post lathe work, while the LX shells are anodized Black. The LX front hub uses the same bearing principles. Steel bearing cups are pressed into both sides of the shell, ten 4.75mm (.1870") diameter steel ball bearings are used in each side. A stamped cadmium plated steel snap-in dust cap serves as the initial contaminant seal. The hollow axle is made of steel with a 10mm outer diameter and a 5.5mm inner diameter. This LX axle, because of its diameter and wall thickness appears less likely to fail than the XT. The steel cone race has a ground bearing surface. A stamped steel shroud on each cone race closes over a raised lip on the steel dust cap making and interlocking, though non-contact seal. A locknut at each end of the axle holds everything place. A custom shaped rubber seal encloses the bearings at each end. The base of the rubber seal rests inside of the steel dust cap, while the top grips around the locknut and cone race which revolve. With each revolution, on the LX hubs, these rubber seals add real, measurable drag and resistance. The hub, with these seals in place, doesn't freely revolve, but removal is easy, and you gain 3 grams per pair. The M563 LX rear freehub is Hyper compatible (Drive, Glide), uses a 135mm long rear axle to accommodate 7 speed gearing. The non-drive side has a steel bearing cup pressed into the shell, while a steel cupped freehub is used on the drive side. Both sides use nine 6.35mm (1/4") diameter steel ball bearings. The bearing cavity has a stamped of cadmium plated, steel, snap-in dust cap with a raised ridge to interlock beneath a shroud from the cone race. The steel cone race has a ground and polished bearing surface. A stamped steel cap from its backside encloses the bearings, a groove around the cone race seats a custom rubber seal within the two steel dust caps. An external rubber seal covers the cone race and spacers. Its base seats into the steel snap in cap while its top grips a spacer near the locknut. Though this seal may offer some protection to the bearing assembly, it adds measurable resistance and impairs the hubs free revolution. The axle is made of steel, with a 10mm outer diameter. The LX hubset comes with a pair of steel quick release skewers that rely on an internal cam design which constrict to close or lock the hubs onto the bike. The adjusting nut is made of cadmium plated steel that is enclosed with a Black plastic cap. The nut has four position points to provide a finger grip at tightening. The front hub has a 46mm hub flange diameter, with flanges spaced 68mm apart. The front spoke holes have a 38mm center circle diameter. The rear hub has a 54mm hub flange diameter, with 55mm spaced flanges. The rear spoke holes have a 45mm center circle diameter. With skewer, the front weighs 241 grams, (skewer is 77.5 grams, lighter because of the plastic cap), the rear with skewer, and without cogs, weighs 445.5 grams, (skewer 83 grams). The front hub requires a one thin cone wrenches to work on, because Shimano leaves just a 2.5mm access to the cone race and the locknut. You will need a 13mm to hold the cone race, while an adjustable wrench will loosen the locknut. For the same reasons you will need a thin 15mm to hold the cone race, on the rear, and an adjustable wrench will remove the locknut. The hubs are available in either 32 or 36 hole drilling, matched the way you want. Please specify hole pattern.